When thinking about calisthenics, a lot of people flash back to that junior high P.E. teacher who would challenge anybody to a push-up contest. Typically, people trying to build good-looking bodies won’t turn to calisthenics. Instead, they gravitate to weight lifting and machines. But there’s a movement on the verge of capturing the fitness industry’s attention, and it’s certainly not a push-up competition. It’s an advanced form of calisthenics practiced by some of the most ripped athletes around. They’re shocking onlookers, performing handstand push-ups on a pull-up bar, twisting their bodies like gymnasts, and displaying unimaginable upper body strength. 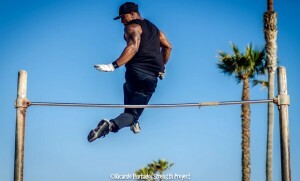 Advanced calisthenics is not only a type of resistance training, but it’s also an art form. At the Fit Expo, there was a lot of buzz surrounding Battle of the Bars, one of the first competitions of its kind on an official level. Cephas has a background in football. He played with NFL Pro Bowl wide receivers Steve Smith and Chad Johnson at Santa Monica City College, then went on to play at Tennessee State. As a 400-meter sprinter in track, he clocked in at 47.7 seconds. Two severe knee injuries ended his football career, but he continued with weight training to build an impressive physique. After exposure to the athletic trend on YouTube a year ago, Cephas has revamped his entire workout regime. Advanced calisthenics now make up 80 percent of his workload, including most of his upper body workouts. He still employs weight training for legs and to test out his upper body strength. The test results? He still has it – even though he rarely picks up a barbell. Cephas weighs in at slightly more than 190 pounds with very low body fat. Compared to body builders, power lifters and athletes who focus on weight lifting, athletes who specialize in advanced calisthenics have slimmer, more muscular builds. Cephas adds resistance by either changing the tempo of his movements or wearing a weight vest or weight belt. When he’s performing various types of push-ups, he weights up his back. The great thing about advanced calisthenics is that it can be practiced almost anywhere. It gained popularity on the East Coast, where athletes practice outdoors in parks and playgrounds. New York City crews such as the Bar Starz, Bartendaz, Bar-Barians, and Beastmode have perfected these movements and wowed crowds for years. 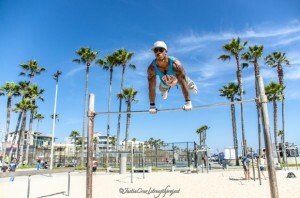 Cephas is now doing his part to give advanced calisthenics more exposure by taking these competitions to fitness expos. These amazing athletic feats are not mainstream like CrossFit, but these athletes are getting the ball rolling. Now, people are dropping the weights and hitting the pull-up bars.